From a viewpoint below the Long Point Lighthouse there are stupendous views of Notre Dame Bay and the dramatic scenic coastline near the town of Twillingate - an ideal place to watch a stunning sunset. A large inlet of the Altantic Ocean, Notre Dame Bay covers an area of 6000 square kilometres off the northern coast of Newfoundland, Canada. Its scenic coastline is punctuated by numerous coves and bays which are in turn fringed by picturesque cliffs. 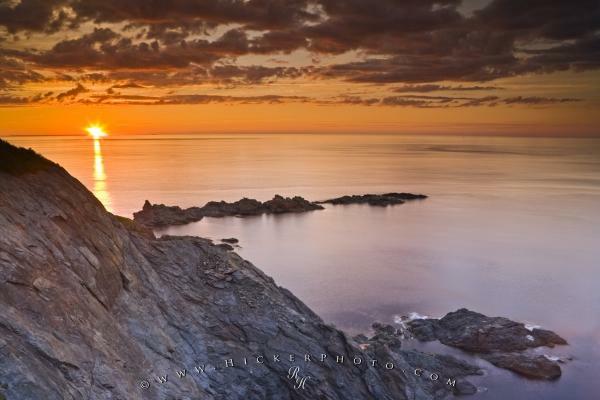 The scenic viewpoint below the Long Point Lighthouse (near the town of Twillingate) offers a clear view to the west with dramatic sunset scenery over Notre Dame Bay coastline and the Atlantic Ocean. Coastal scenery seen from just below the Twillingate Long Point Lighthouse, Twillingate, Road to the Isles, Highway 340, North Twillingate Island, Notre Dame Bay, Kittiwake Coast, Newfoundland, Newfoundland Labrador, Canada. Photo of a dramatic sunset over the scenic and rugged coastline near Twillingate, Newfoundland, Canada.